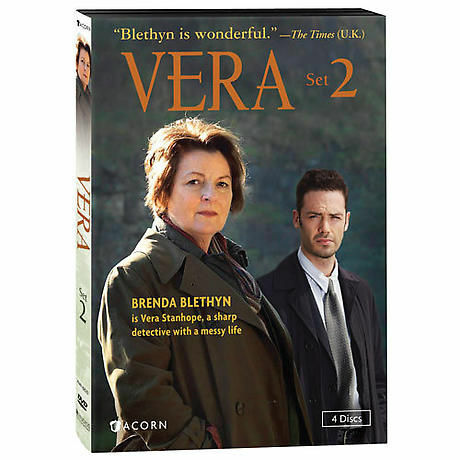 Two-time Oscar® nominee Brenda Blethyn (Pride & Prejudice, Secrets & Lies) returns as Vera Stanhope-a police detective with a disheveled exterior, a sharp tongue, and an uncanny ability to solve crimes. Tough, dedicated, and more than a little irreverent, DCI Stanhope is assisted by her long-suffering sergeant, Joe Ashworth (David Leon, Rock 'n Rolla); DC Kenny Lockhart (Jon Morrison, High Times); and forensic pathologist Billy Cartwright (Paul Ritter, The Eagle). Inspired by Ann Cleeves's best-selling mysteries, this second series of Vera is set in the Northumberland of the original books. In four new feature-length dramas, Stanhope delves into a world of shadows and suppressed passions where everyone has something to hide-and her own private life and past are never far away. 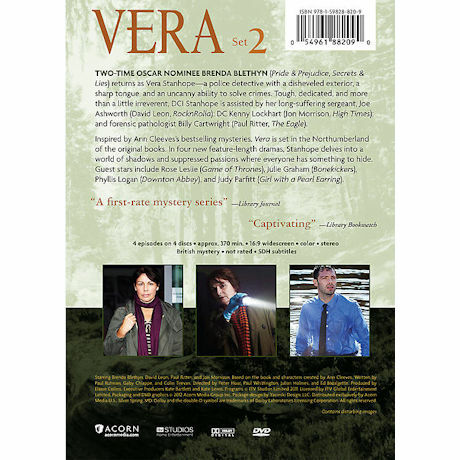 Vera Set 2 includes 4 episodes, 4 DVDs, approx. 370 minutes, SDH.